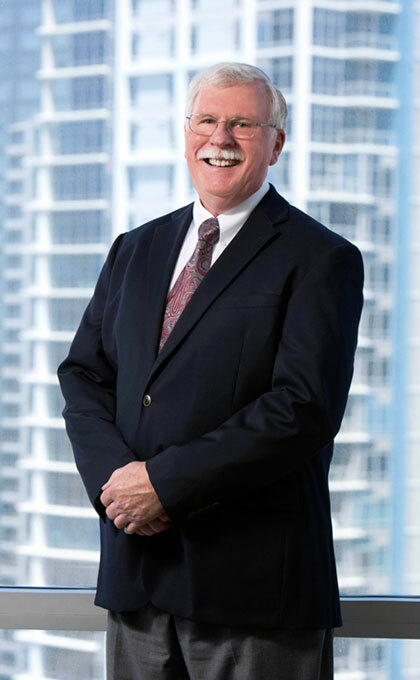 James E. Drummond has extensive experience in all phases of construction law, including contract negotiation and interpretation, construction financing, resolution of disputes arising during the construction process, prosecution and defense of collection disputes, as well as the litigation of construction contract and defect claims. He represents owners, architects, general contractors, subcontractors, and suppliers on both private and public projects. Mr. Drummond provides ‘real time’ legal advice to project managers and field personnel to resolve issues as they arise during construction. He assists contractors and indemnitors in work out situations with sureties. His practice includes business formation, real estate, collection, and special asset work for financial institutions. Mr. Drummond has an AV® Preeminent™ Peer Review Rating by Martindale-Hubbell and was named a Top San Diego Lawyer in 2015-2019 by San Diego Magazine. He has also been recognized as a San Diego Super Lawyer in the field of Construction Litigation from 2007-2015. Mr. Drummond is a former lecturer on Construction Financing and Construction Collection Remedies for the University of California and San Diego State University. Mr. Drummond is a member of the San Diego County Bar Association.